Choosy males and aggressive females - a role reversal has been found in the sexual behaviour of the topi antelope. Some males are so forcefully pursued by pushy females that they refuse the advances of previous partners. According to research published in the journal Current Biology, this helps males conserve their sperm for the possibility of mating with new females. It therefore increases the chances of fatherhood with the widest possible number of partners. Dr Jakob Bro-Jorgensen, the scientist conducting the Zoological Society of London (ZSL) research, said: "In cases where the male antelope was free to choose between females, he deliberately went for the most novel mate, rather than the most high-ranking." He added: "However, some pushy females were so aggressive in their pursuit of the male that he actually had physically to attack them to rebuff their advances." 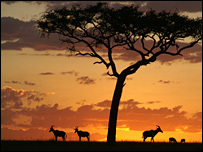 The research was undertaken in the Masai Mara area of Kenya, in the traditional breeding grounds of the topi. Females are fertile for a single day only. The topi antelope (Damaliscus lunatus jimela) come together once a year, for just over a month to mate. Dr Bro-Jorgensen said: "It is not uncommon to see males collapsing with exhaustion as the demands of the females get too much for them." He observed that each female would mate, on average, with four males, while some reached 12 different partners. And each individual would be mated with approximately 11 times, although one pair was observed together on 36 occasions. "[The females must] ensure that they become pregnant, and preferably with a hotshot male, so they must focus all their energies on ensuring that males mate with them in that time," Dr Bro-Jorgensen explained. These findings are contrary to conventional sexual selection theory which says males are competitive and females are choosy. Talking to the BBC News website, Dr Bro-Jorgensen said: "We may not have our eyes open to the fact that opposite sexual conflicts may occur more commonly than we think. Normally, males are persistent and females resistant. What I saw in African topi was unexpected." The synchronised mating activity, and the species' promiscuity, makes males the limited resource and females the competitive ones. It is thought the females are interested in mating with several partners to ensure fertilisation, in case their first choice happens to have reduced sperm supply, or is genetically incompatible with them.